He sold his soul for rock 'n' roll! It is merely serendipitous timing that Wright’s UK screening took place mere weeks before the New Beverly’s upcoming shows on October 26th and 27th, but it provides excellent preamble. 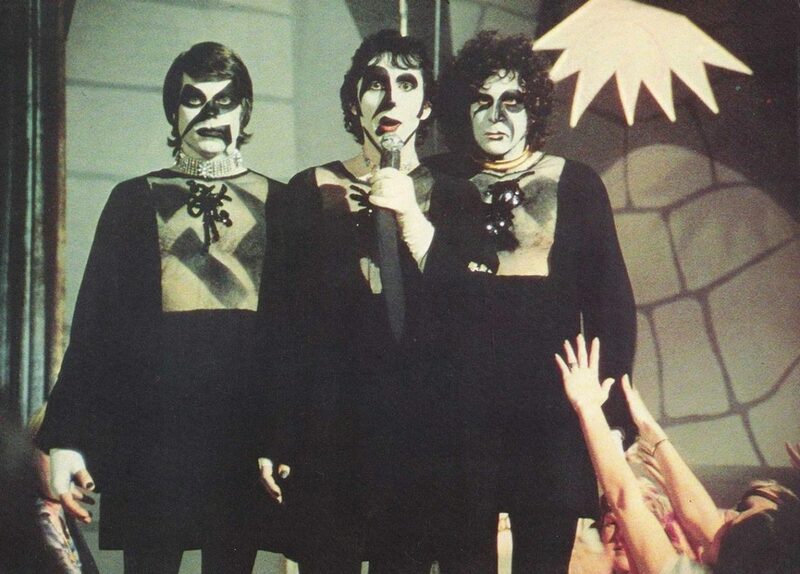 Moreover, it continues the film’s reputation as possibly the single greatest cult horror rock musical that is still criminally underseen by a wide audience. Or, to apply Wright’s welcoming and positive spin, it is the single greatest cult horror rock musical that millions still have the wonderful opportunity to experience for the first time. 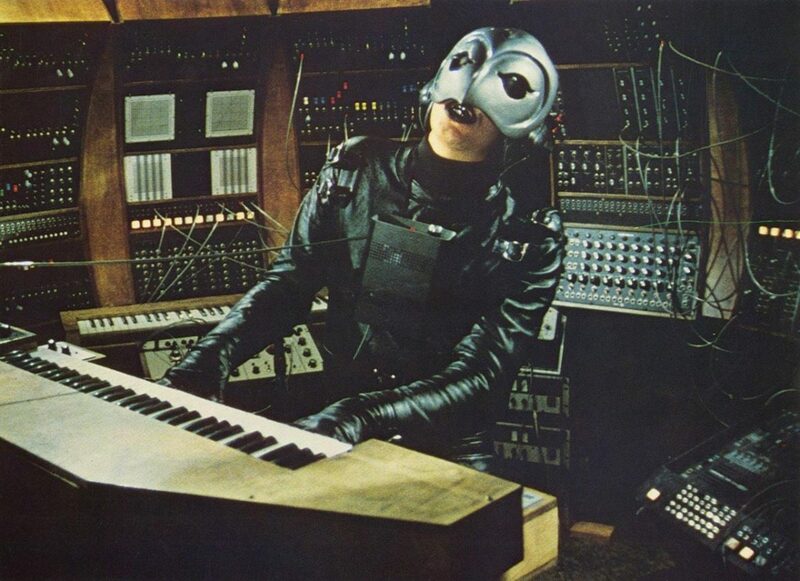 Phantom of the Paradise depicts the tragic tale of Winslow Leach, a naïve musician whose ambitious song cycle is stolen by evil music impresario Swan, who himself has made a devil’s bargain for eternal youth and success. Framed, imprisoned, and mutilated, Leach reluctantly joins with Swan in the hopes of steering his compositions to lovely rising star Phoenix. 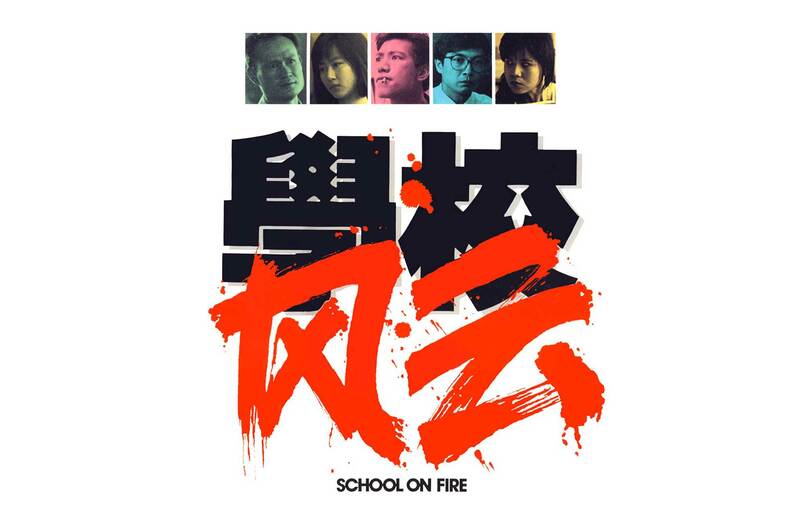 But when Swan again betrays him and tries to stage his songs with lesser talents, Leach becomes an avenging Phantom, violently retaliating against those who stand in Phoenix’s path to stardom. And like any opera, rock or otherwise, you cannot expect a happy ending. 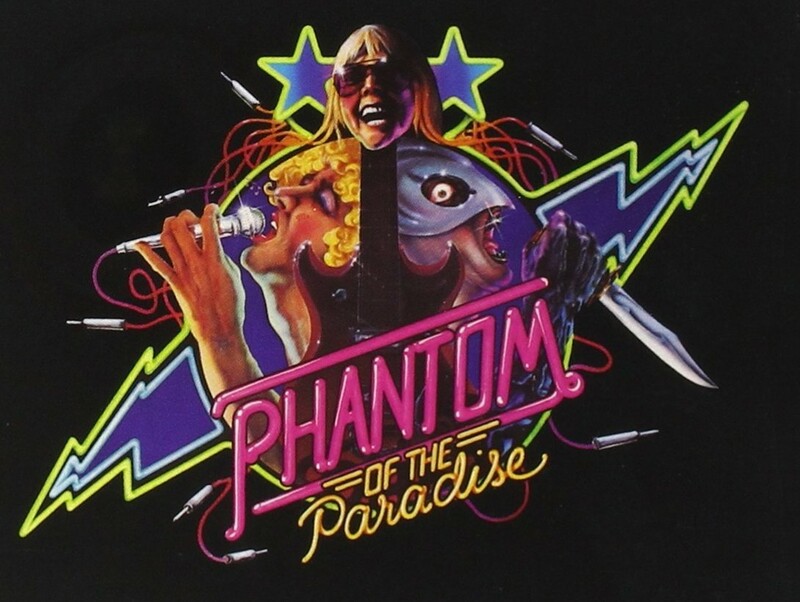 De Palma first came up with the story for Phantom in 1969. 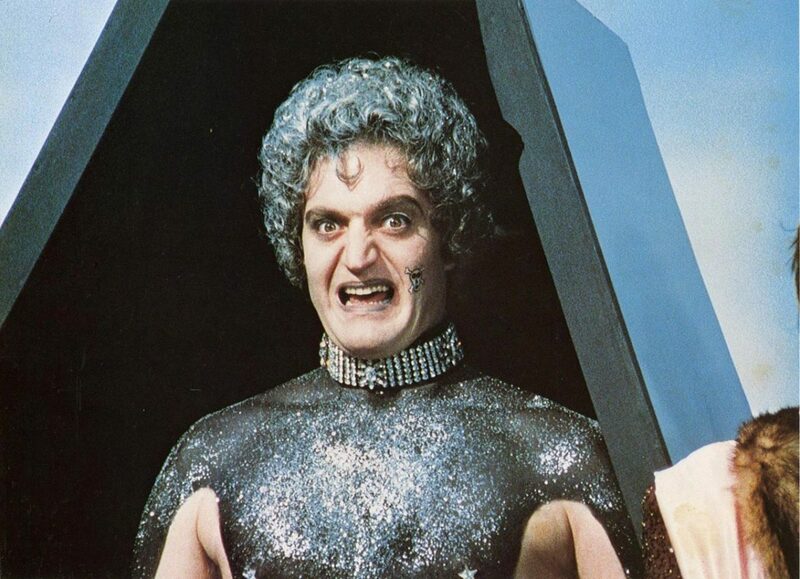 The screenplay is an energetic and ambitious mélange of elements from classic horror works – The Phantom of the Opera, Faust, The Portrait of Dorian Gray – and short winks to even more. Such has been the template for many of De Palma’s films, but while most of the others pay homage in intellect, style, and execution, Phantom imbues a sense of genuine fun as well, as if all our youthful moments of being in our room reading comics and listening to loud music while a monster movie was on TV were put onscreen. It is the closest we may get to experiencing De Palma as a playful teen with toys as opposed to a technician with tools. 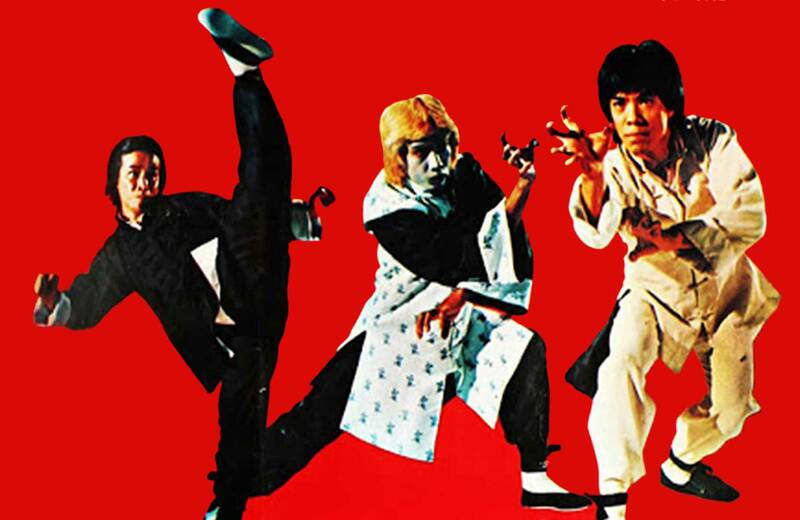 One of the clever ways De Palma injected this theme into the production was during the filming of the climactic finale. Among the extras assembled to watch the doomed event were members of The Performance Group, a NY-based troupe who staged what they called “Environmental Theatre,” which put the audience and actors so close to each other that in effect everyone became part of the show. De Palma’s earlier film Dionysus in ’69 documented them performing Euripedes’ play The Bacchae, and marked his first major use of split screen. 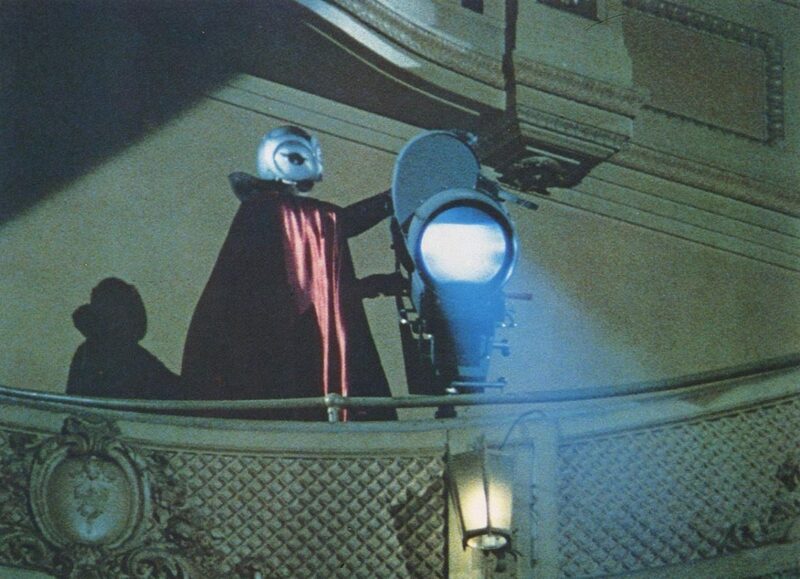 For Phantom, De Palma had Performance Group players planted in the theatre audience to alternately provoke Finley, Williams, and other extras, to increase sense of tension and chaos. The entire song score was written by Williams, who also provided Leach’s Phantom singing voice. Williams deftly leaps through multiple rock styles – ‘50s revival, ‘60s Beach Boys, theatrical glam, ballads, and more, demonstrating the dexterity that has made him beloved for decades. 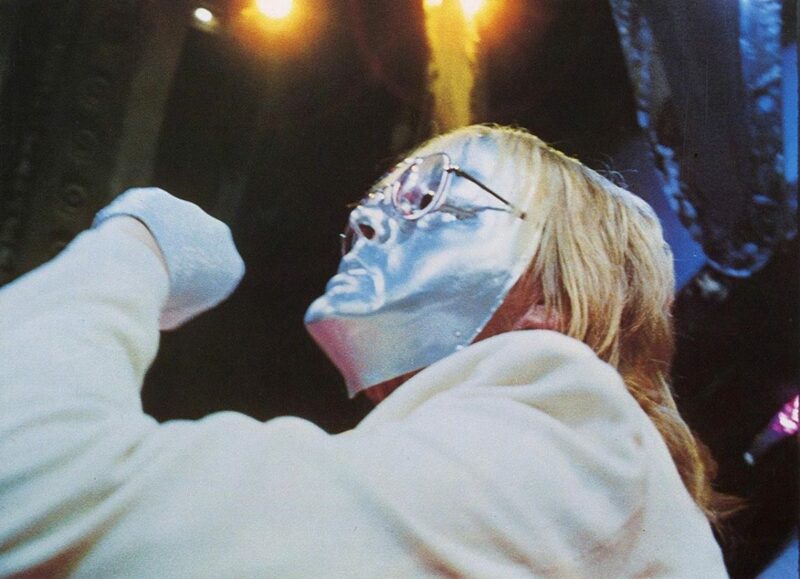 “[It’s] one of the greatest gifts I’ve ever been given because it allowed me to satirize the music that I loved,” he observed. For this film, he received an Academy Award nomination for Best Original Song Score and Adaptation, and a Golden Globe nomination for Best Original Score. Phantomis also notable for the splendid production design by Jack Fisk, as well as set dressing by Sissy Spacek. Spacek met and married Fisk during the making of Terence Malick’s Badlands, also produced by Pressman. This, along with Peter Traynor’s Death Game, is one of the rare non-acting film credits for Spacek, who would later headline De Palma’s adaptation of Stephen King’s Carrie. The production of Phantom was plagued by a ridiculous amount of legal wrangling. 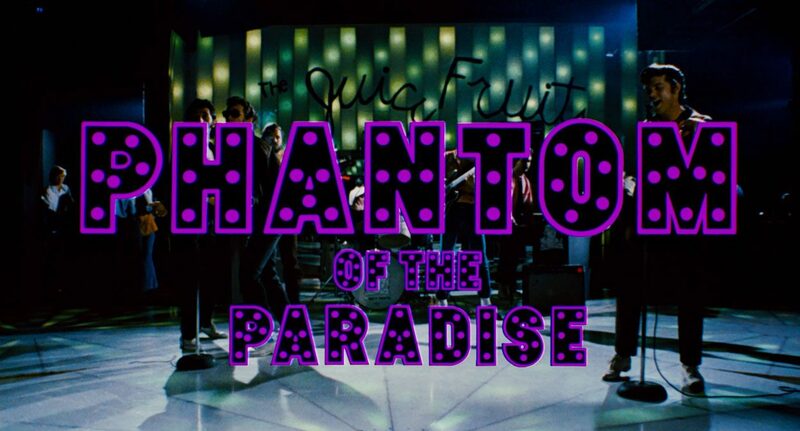 De Palma’s original title Phantom of the Fillmore was dropped when Bill Graham refused permission to his venue’s name. 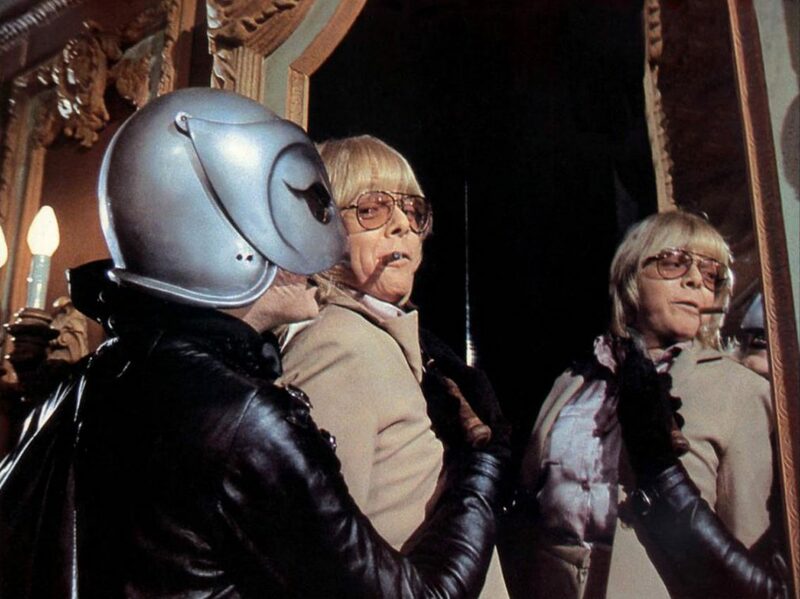 Then the working title Phantom was threatened by the owners of comic strip hero “The Phantom.” The final release title Phantom of the Paradise was initially threatened by Universal until it was proven Leroux’s novel was a public domain work. And most infamously, Led Zeppelin manager Peter Grant threatened a lawsuit over the “Swan Song” record name. Worried that it would jeopardize the impending purchase of the film by 20th Century Fox, all references to Swan Song were quickly and expensively overmatted or cut out before release, though a few are still present if you know where to look. Eagle-eyed grindhouse movie lovers should pay close attention during the scene in Swan’s boudoir. Among the beautiful groupies clamoring for Swan’s affections are Jennifer Ashley from The Centerfold Girls, Robin Mattson of Bonnie’s Kids, Janus Blythe from The Hills Have Eyes, Patrice Rohmer from Revenge of the Cheerleaders, Janit Baldwin from the would-be Carrie ripoff Ruby, and Cheryl “Rainbeaux” Smith from Lemora, Swinging Cheerleaders, Caged Heat and many more. 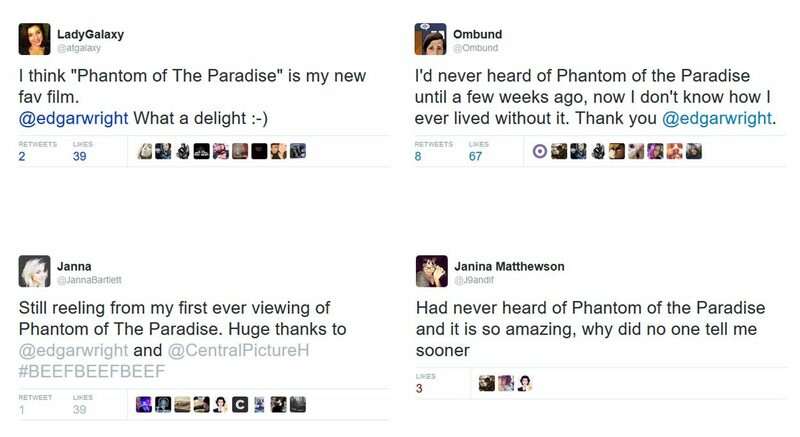 It is now legendary that Phantom opened and closed quickly in 1974 to disappointing returns in almost all the world, except for Paris and Winnipeg; in the latter city, the film played for months long after the U.S. first-run ended. 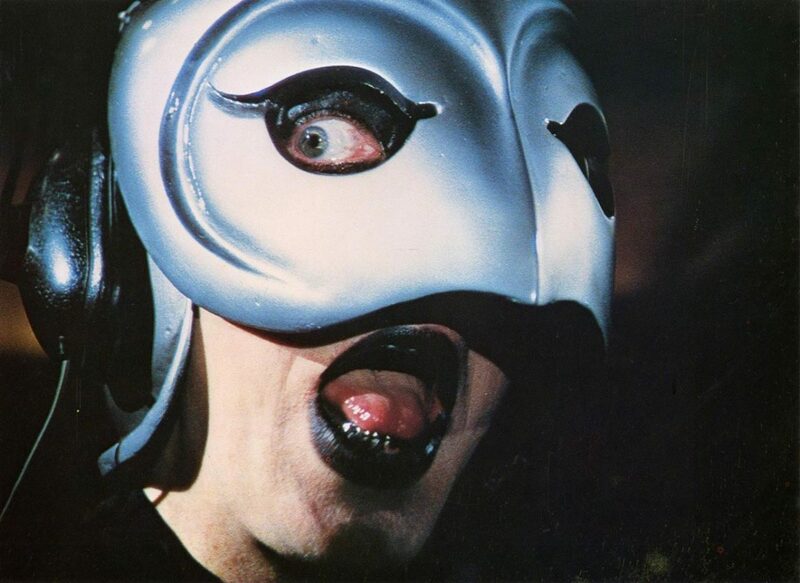 Today, Winnipeg is the site of a yearly fan convention “Phantompalooza,” and a documentary about the beautifully unlikely phenomenon, called Phantom of Winnipeg, has been in the works from Canadian documentarian Malcolm Ingram. 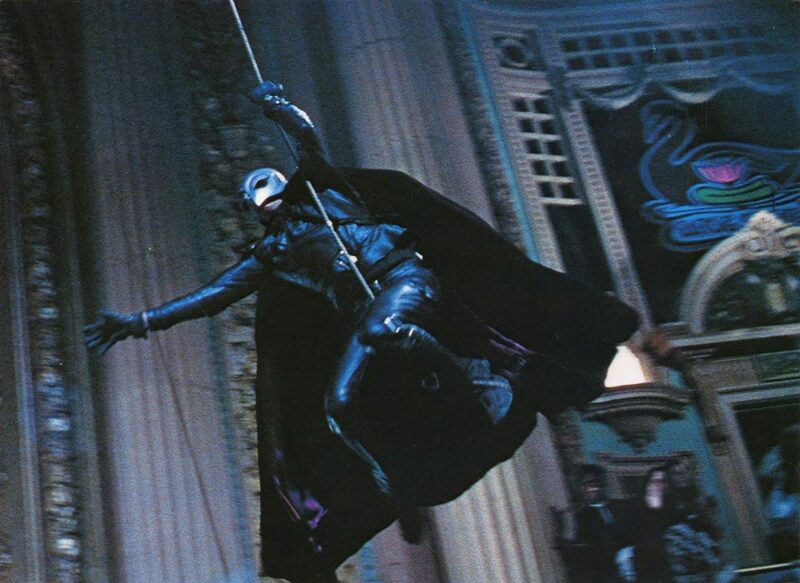 40+ years removed from its release, with the support of partisans like Edgar Wright, Guillermo Del Toro, and Daft Punk, Phantom is enjoying its largest popularity. And during our Shocktober celebration, we invite you to come to the New Beverly and experience it, be it as a new film to watch and learn, or an old friend to touch and return.